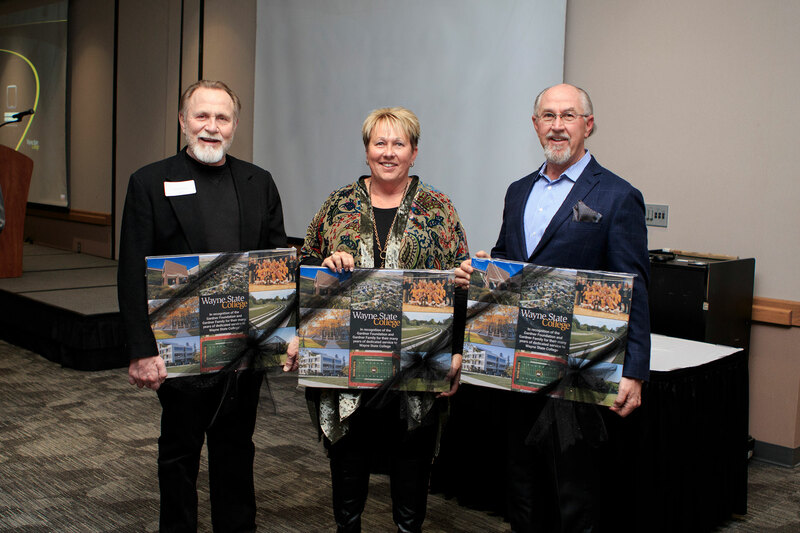 Kirk Gardner, Leslie Bebee, and David Gardner were recognized by the Wayne State Foundation on April 3 in honor of their mother, Jeanne Gardner. A dinner and program was held April 3 honoring the Gardner family. The event also featured a performance by Catapult, a group famous as a finalist on NBC’s America’s Got Talent and revered worldwide. Wayne State President Marysz Rames and the Wayne State Foundation celebrated completion of the fund-raising for the Jeanne Gardner Black & Gold Performing Arts Endowment with a dinner and program honoring the Gardner family on April 3 at the college. The Jeanne Gardner Black & Gold Performing Arts Endowment, which has reached $500,000, is named so because Gardner was a champion of the arts. The endowment was funded by a range of generous donors who wanted to recognize the legacy Gardner left with Wayne State and Northeast Nebraska. The endowment secures funding in perpetuity for annual shows that include full-scale opera and theatre productions, dance performances, orchestras, chamber music and award-winning actors. The April 3 event featured a performance by Catapult, a group famous as a finalist on NBC’s America’s Got Talent and revered worldwide. Catapult is a theatrical art form combining dance, storytelling and sculpture. Jeanne Gardner, class of 1967, was a dear friend, benefactor and alumna of Wayne State who lived her life well with a commitment to family, community and church. Jeanne and her late husband, Dan, founded the Gardner Foundation in Wakefield, Neb., and through their vision have made transformational contributions to the college. Dan and Jeanne's children, Leslie Bebee, Kirk Gardner, and David Gardner, are now the trustees of the Gardner Foundation and continue to support the college as their parents envisioned. After Gardner’s passing on Sept. 17, 2014, the Wayne State Foundation Board of Trustees launched a fund-raising effort to establish the $500,000 endowment. The Black & Gold Series at Wayne State was a perfect match with one of Gardner's passions because she was involved in theater at many levels. This endowment also serves as a way to bring back live professional performances to Ramsey Theatre on the campus of Wayne State College. For more than 50 years, the Wayne State College Black and Gold Performing Arts Series presented cultural programming to serve the region as part of the mission of the college.